This picture shows a 6’x14’ guardhouse from the front. 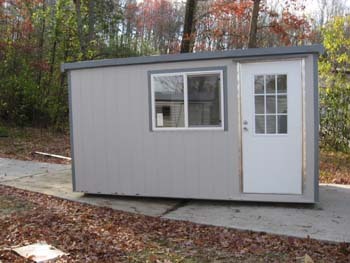 This info covers a 6’x14′ guardhouse, however you can get information on any size guard house. Size: Into what type of business environment will the guard house be placed? Will you need one small guardhouse, one larger guardhouse or perhaps two smaller guard houses? Even if only one small guard house is needed, the layout is still important, which is the next topic. Layout: As seen in the “Sample Layout” illustration below, the way a guard building is laid out is vital. You may already know exactly how you want your guard building designed and laid out. You may have questions about design or you may change your mind and decide you do or do not want counter tops, certain electrical or a restroom included, which is the next topic. Restroom: Is the guardhouse the correct size to include a restroom? A restroom in a guardhouse has its own specs as well as plumbing needs to be met outside the structure’s walls at the commercial location. Many factors come into play when considering the design of a guard booth and whether or not to include a restroom. Will the guardhouse be used as more of a ticket booth that requires specific HVAC (heating and air conditioning) requirements in order to keep the interior comfortable for its occupant(s)? The next topic will consider HVAC and electrical. 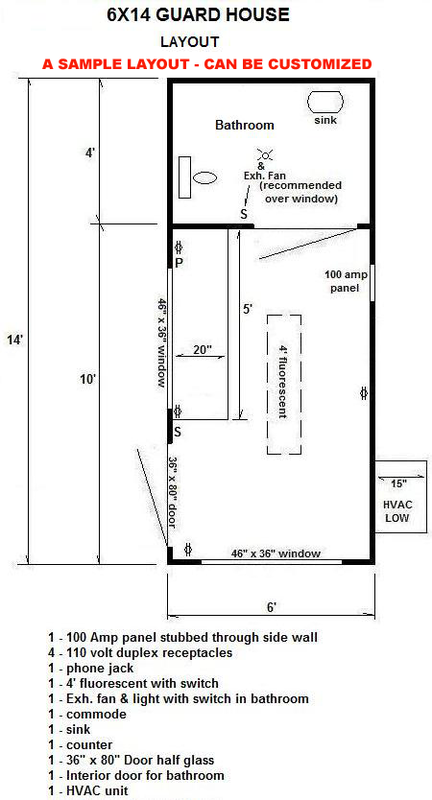 Electrical: What type of HVAC will be necessary in your guard house? Will you need special electrical for security measures such as monitors, computers, drivers, servers, audio equipment and more? These types of electrical items in a guardhouse must be kept at certain temperatures to maintain reliable performance this topic may be a consideration for you. There is also the fact that a person or people will likely be occupying the guard house or guardbooth during its use and therefore a temperature-controlled environment and certain electrical setups will help add to the comfort level as well. Where can you see more guardhouses? See more guardhouses here. Where can you get in touch with us about guardhouses? Get in touch with us about guardhouses here. Security concerns today: Security is on people’s minds. Security issues have come up in the last few years in places that people would not have imagined years ago. This gets people edgy and it gets people thinking. What about businesses that need to protect the perimeter or their gated areas? Security buildings, guardhouses, checkpoints and tollbooths are used in many commercial and industrial settings. These secure buildings are becoming more and more common, especially because of breaches in security in places previously thought to be secure. Many corporations are concerned with security in today’s world. Schools and campuses are concerned with security, as are many business industrial settings. Security guards serve many functions and they are usually known for guardbooths and check-ins. Having a secure structure is an important function for business settings on many levels. The Need for Security Buildings: Many industries and corporations use secure check-in or check points as a part of their every day processing. Some companies and businesses also use them. Many businesses need a secure site and a lot of industrial settings require added security. Businesses are beginning to grow larger and see their needs changing and many need security on demand – sooner than initially thought. Other places that use security points are secure parking garages and upscale residences or gated communities. Gatehouses for secure areas are more common now than they used to be. Government facilities including schools and even college campuses have even seen security issues present real challenges due to unfortunate violence in recent years. Who Uses Secure Guard Buildings? Guardshacks secure guard booths and ticket booths are known for being a shelter for guards to monitor a location, have computer screens and for a guard to monitor the comings and goings of the area under watch or patrol. Some levels of security require checkpoints to have different requirements, depending on the business or industry. What Do Guardhouses Look Like? Guard buildings and guard booths can be customized but they are known for a basic look. You can see some pictures of them outside and inside as well as gather more secure guard buildings facts here. Customizing a guard building or guardbooth is easy to do and an industry standard; each secure building is unique to the buyer. The buildings can have counters, full bathrooms, HVAC, electrical panels, wiring/outlets/electrical, vinyl floors, walls insulated and paneled, finished and ready for use in any professional setting.